Generally elephants fascinate me but one particular elephant has a special place in my heart. She is Topsy who was an Asian elephant killed by electrocution at New York’s Coney Island in 1903. She was murdered because she killed people through no fault of her own. She was a wild animal who people misjudged they could tame by dominating her. But, as I say in my presentations about Topsy: Yes, you can take wild animals out of the wild and believe they can be tamed. But you cannot take the wild out of a wild animal and make them tame. Topsy preoccupies my mind as I write her biography. I gave my Topsy presentation at the third Minding Animals International (MAC3) conference in India in January and was discussing it with my MAI colleague, Rod Bennison, when he said that I must read a book called Moti by Christine Townend. I first came into contact with Christine when I edited the Coordinating Animal Welfare bulletin in the 1970s and 1980s. Since then she was synonymous in my mind with Australia and animal activism but we had never met. Until the MAC3 conference when we did meet and I learnt about her book Moti: An Indian Elephant. Christine graciously made generous remarks about my presentation on Topsy. Christine’s book is a novel about an elephant called Moti. She is the protagonist. Books, films, art and other creative expressions through the experiences of others other than humans are not always successful. They can be ridiculous, absurd, sentimental, incredulous, silly, etc. To succeed there must be, of course, a unique creativity that makes it special but also knowledge, insight and wisdom to make it believable. This helps to explain why, for example, such books as Watership Down by Richard Adams were so popular. The author knew what he was writing about because he had studied rabbits in the place where the novel was set. It helped greatly that he was a genius in telling a story. Further, I recall chairing a meeting at which Richard Adams was a guest speaker. In person, he was as entertaining as he was intimidating! Anyway, I approached Moti with some caution because I was unsure as to whether it would be any good or not. I soon realised, however, that Christine had written a very special novel. I read it slowly because it was a difficult book to read. Not difficult because it isn’t well written because it is. Not difficult because it is sentimental because it isn’t. It’s a difficult book because it’s a surprisingly damn fine book. Christine puts you into the lives of elephants. You know that because it’s a human-dominated world in which the elephants live and that’s why it’s going to be a difficult novel to read. The elephants we saw–like Moti–at Amer Fort near Jaipur in Rajasthan. I don’t want to give the narrative away. Except to say that at one point Moti is an elephant who works with others carrying tourists up to the Amer Palace near Jaipur in Rajasthan. I visited Amer Palace after MAC3 and saw the elephants carrying the tourists up the mountain to the palace. (Me and my tour group from MAC3 went by jeep.) Even though I hated what the elephants were doing it was thrilling nonetheless to see them and be so close. 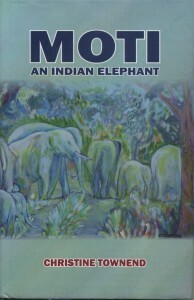 How I wish I had read Moti by then and could have imagined her to be one of the elephants I saw. Christine’s decades of work for animals in Australia and India and in particular her personal knowledge of elephants inform Moti to make it a compelling read. There’s much I could quote but there’s one aspect I’d like to focus on because I found it to be so intriguing. At the beginning of Chapter Two, we’re introduced to the Elephant Mind. 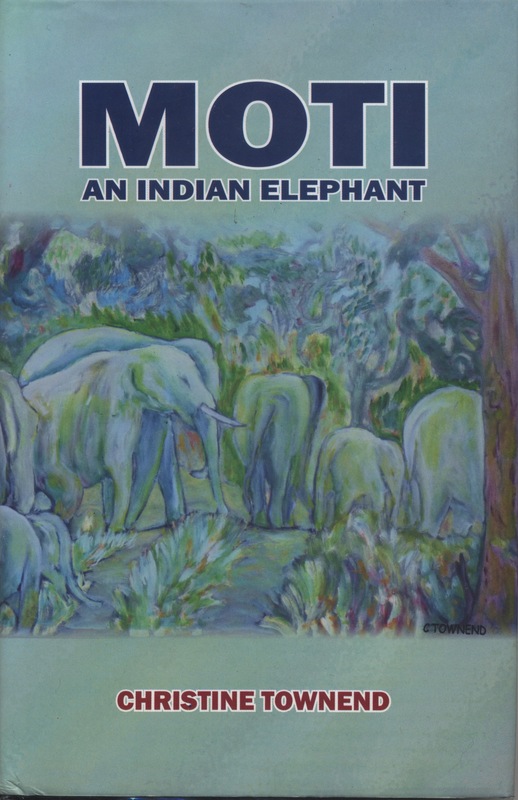 My fascination with elephants deepened after reading Moti. We know elephants communicate in ways which we’re unable to hear and ways in which we’re unable to know and at great distances that beg our disbelief. But what if the Elephant Mind, along with what Christine calls the Great Elephant Soul, are real? What if elephants communicate with each other in ways that make ours seem parochial and pedestrian? Great fiction takes us to places in which we can only imagine. Christine Townend’s Moti took me to where I could imagine elephants in touch with each other in ways unimaginable to me. In doing so, Moti further strengthened my commitment to Topsy and the injustice she endured and in telling her life story so that it’s never forgotten. Moti, An Indian Elephant is available from Help in Suffering at a cost of $US20 which includes postage and handling. All proceeds from the sale of the book go to Help in Suffering. After depositing the payment, please inform Mr. Nirmal Jain at nirmal@his-india.in that you have transferred money for purchase of the book.